Well, NH7RO is correct in only two of the statements, the second and the fourth, but that didn’t prevent him offering advice. dB is just a ratio. It isn’t ever a quantity. dBi and dBd are related by a fixed quantity; dB over Isotropic (dBi) is 2.2 dB higher than dBd (dB over a dipole in free space). Although his distinction between a ratio and a quantity is difficult to understand, broadly, his second statement follows established convention. A dipole in freespace can have 2.15 dBi gain, or 0 dBd gain. A dipole over earth can have 8.5 dBi gain, which is still normally zero dBd gain if they do dBd the conventional way. We not only need to know the dBi or dBd, but if the data is over earth or in space and if they did the normal way or not for dBd. So, he has equated a (presumably half wave) dipole over real ground with a gain of 8.5dBi and 0dBd. We can see dBd does not mislead us, while dBi does. dBd almost never gives inflated values, but dBi sure does! For example, I could say an antenna the same performance as a dipole has 8.5 dBi gain. But if I give gain in dBd, the standard is both the dipole and the antenna being discussed are over the same media at the same mean height. In freespace or over earth, a dipole has 0 dBd gain. Unless someone violates the universal standard, dBd is always more accurate and less inflated, and less subject to game playing or mistakes. He asserts that the “standard” meaning of dBd is gain wrt a half wave dipole at the same height over the same ground, but he does not cite any reference. That’s also how I use the term dBd, because it’s the only interpretation that has any utility. To define it as meaning dBi-2.14 under all circumstances makes it a pointless measure in my opinion. N3OX opines: If you’re trying to buy a beam, quoting in dBd, where dBd means “gain over a dipole at the same height” is a very honest and straightforward thing to do . The pattern of facts being determined by popular vote is emerging, the consensus is that dBd means gain wrt a half wave dipole at the same height over the same ground. The latter part of that definition has its problems, but lets set that aside for a moment and look at the “utility” as G3TXQ puts it, then explore why the confusion exists. However, facts are not determined by popular vote. Lets compare a W8JK array with a half wave dipole. NEC models were constructed of a W8JK array and half wave dipole, both at 14MHz, lossless and a quarter wave above average ground. The far field patterns were calculated for elevations at the azimuth of maximum gain. 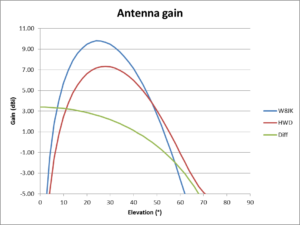 Fig 1 shows the modelled gain of the two antennas. The blue curve is the W8JK, the red curve is the dipole (notwithstanding that displayed filenames, an apparent bug in 4NEC2). Fig 2 shows a different view of gain, this time on Cartesian coordinates and the calculated difference in gain (or gain of the W8JK relative to the similarly located half wave dipole). N7RHO, W8JI, G3TXQ, and N3OX would define the gain of the W8JK in dBd as the difference in gain between the W8JI and the half wave dipole as shown in the green line in Fig 2. The obvious problem is that under that definition, the gain is dBd is greatest where both antennas have extremely low gain (less than -140dB at 0° elevation), it has a value of 4.4dB at 34° elevation where the W8JK has its maximum absolute gain, and it has a value of -165dB at 90° where the dipole has its maximum gain, and a range of values in between those points. So, if dBd did mean the difference in gain between the subject antenna and the half wave dipole in the same situation, then you could pick any number you like over a range. If you were a seller of W8JK antennas, you might choose the gain difference at 0° being 5dB, call it 5dBd to represent your antenna, even though its absolute gain is less than -140dB and essentially unusable for long distance paths at such low elevation. Hams will lap it up, all the good numbers and those practical dBd units. If you were a competitor wanting to talk the W8JK down, you might take the relative gain at 90° elevation and claim the W8JK has gain of -160dBd. So, comparison of an antenna with a half wave dipole in the same situation does not give a single figure of merit. Not only is the relative gain likely to vary with elevation, but also with height, ground parameters, and other environmental factors. 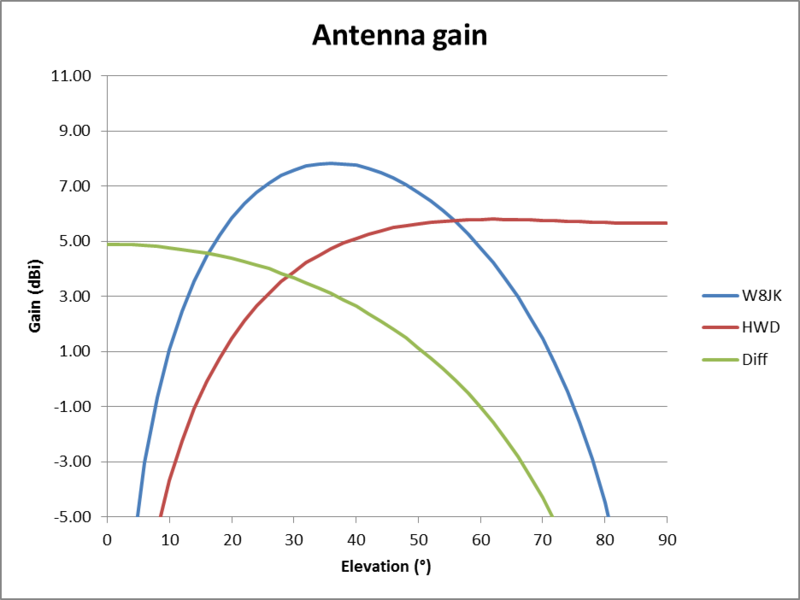 Fig 3 compares the antennas at a half wavelength in height. Note that the difference in gain still varies with elevation, is greatest at impractical elevation and overall is lower, so this gain difference parameter is quite dependent on the antenna height. It is dependent also on other parameters. 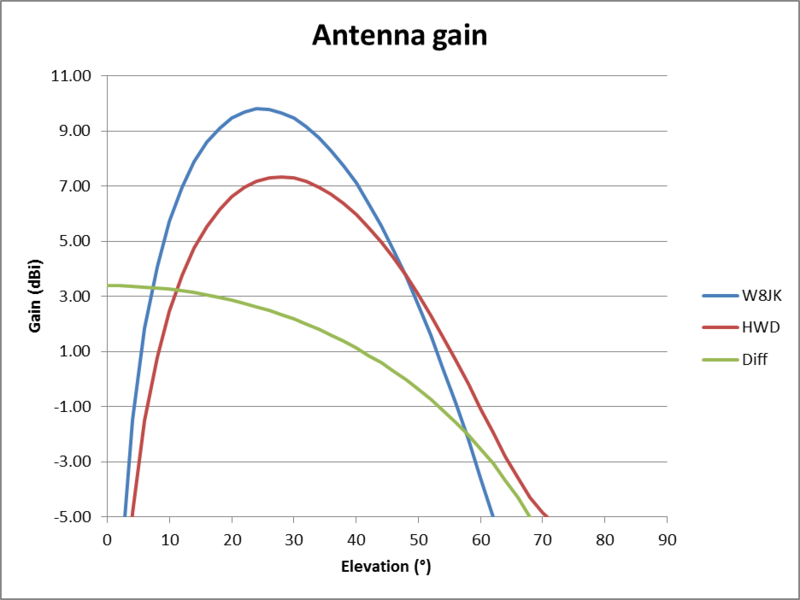 If you were an antenna seller using the difference figure as your figure of merit, you might prefer measurement or simulation at very low elevation and very low height as it often inflates the difference figure. In answer to the question Is there any way to rule of thumb the gain of any antenna over a dipole over earth? No, not a single figure of merit with accuracy or repeatability, any such Rule of Thumb (RoT) is simply ROT. In free space, the gain difference where both antennas have maximum gain (5.93dBi and 2.13dBi) is 3.8dB. From FIg 3, the W8JK is about 2.5dB better than a dipole in the region where both are near maximum gain, but an unscrupulous seller might claim it is 5dB better based on low angle gain in Fig 2. BTW, the inventor claims (Kraus 2002) the free space gain of the W8JK to be 3.9dB over a half wave dipole, and 6.0dBi. He also gives plots of the pattern of the W8JK and half wave dipole at a half wavelength height, the W8JK a little over 2dB better than the dipole in the same situation. The NEC-4 models used for this article are probably a little more accurate in their consideration of the ground reflection than Kraus’s calculations. Outside the ham world, there is a well accepted convention for the meaning of dB, dBi, dBd and procedures for assessing antenna gain. An antenna may concentrate radiated power in some directions. Directivity is the property that quantifies this capability. 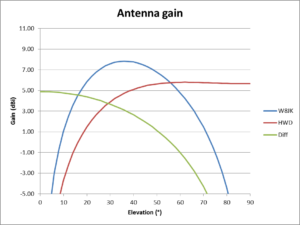 Directivity of an antenna is defined (IEEE 1983) as the ratio of the radiation intensity in a given direction from the antenna to the radiation intensity averaged over all directions. The average radiation intensity is equal to the total power radiated by the antenna divided by 4π. If the direction is not specified, the direction of maximum radiation intensity is implied . Directivity may be expressed as a dimensionless ratio, or expressed in deciBels. Gain of an antenna is closely related to its Directivity, Gain takes into account the efficiency as well as the directional capabilities. Gain of an antenna is defined (IEEE 1983) as the ratio of the radiation intensity, in a given direction, to the radiation intensity that would be obtained if the power accepted by the antenna were radiated isotropically. Again, if the direction is not specified, the direction of maximum radiation intensity is implied. Gain may be expressed as a dimensionless ratio, or expressed in deciBels. The common meaning of efficiency is the ratio PowerOut/PowerIn, Loss is the inverse, PowerIn/PowerOut. Both can be expressed in deciBels. Efficiency or Loss provide the link between Directivity and Gain. Gain=Directivity*Efficiency where Efficiency means total power radiated divided by the power accepted by the antenna. Power ratios are often expressed on a logarithmic scale, the unit is the Bel and it is calculated as log10(P1/P2). A more convenient denomination of the Bel is tenths or deciBels, dB, and it is calculated as 10 log10(P1/P2). The suffix i to dBi is often used to denote antenna gain and for clarity, to distinguish it to antenna gain referenced to a lossless half wave dipole in free space (dBd). To a certain extent, the i suffix is redundant under the definition above of Gain, but is used for clarity in a world confused by those who use gain to mean with reference to a dipole. Some people prefer to refer to the gain of an antenna relative to a lossless half wave dipole in free space, and it is denoted dBd. The gain of a lossless half wave dipole in free space can be found by calculation to be 2.14dB, so there is a fixed offset between dBi and dBd, dBd=dBi-2.14dB. This meaning is use for example in (ITU 1983) and (FCC OET 2010). Readers might wonder of the utility of dBd, since to use gain in most calculations, it must be converted to isotropic gain (dBi or equivalent). Some other users, predominantly drawn from the ham radio community, insist on a different definition of dBd as in the quotes earlier in the article. The consensus seems that dBd means gain wrt a half wave dipole at the same height over the same ground. The discussion under the heading “practical example” above shows the folly of this definition, even worse if you considered different heights. It is the variable meaning sometimes assigned to the term dBd, especially by hams, that is the strongest reason to not use the term in the interest of clarity. Hams are inclined to give well known terms unconventional meanings, to invent their own terms that are sometimes synonymous with well known terms, and to shy away from quantitative definitions. ON4UN (Devoldere 2005 p5.1) offers [a] transmitting antenna should radiate all the RF energy supplied to it in the desired direction, at the required elevation angle (directivity) , as a quite inadequate explanation of the term Directivity, and goes on to discuss Horizontal Directivity and Vertical Directivity. All antennas, even the simplest types, exhibit directive effects in that the intensity of radiation is not the same in all directions from the antenna. This property of radiating more strongly in some directions than in others is called the directivity of the antenna. (Straw 2007) sets out to explain directivity with [t]hat is to say, an isotropic antenna favors no direction at the expense of any other—in other words, it has absolutely no directivity . What does absolutely no directivity mean, zero directivity? The Directivity of an isotropic radiator is by definition 1. Several pages later they do define Directivity: [t]he ratio of the maximum power density to the average power density taken over the entire sphere (which is the same as from the isotropic antenna under the specified conditions) is the numerical measure of the directivity of the antenna . I want to emphasize that the term horizontal directivity is really meaningless without further definition. 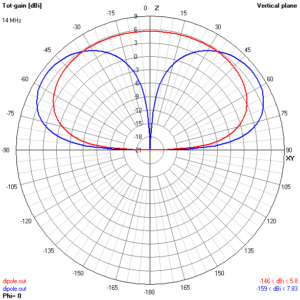 Azimuthal directivity at a takeoff angle of 0º (perfectly parallel to the horizon) is of very little use, since practical antennas produce very little signal at a 0º wave angle over real ground. This issue is important when designing or modeling an antenna. It would be ideal to design an antenna that concentrates transmitted energy at a relatively low angle, while exhibiting the highest rejection off the back at a much higher angle (to achieve maximum rejection of stronger local signals, which as a rule come in at a much higher wave angle. Horizontal directivity should always be specified at a given elevation angle. 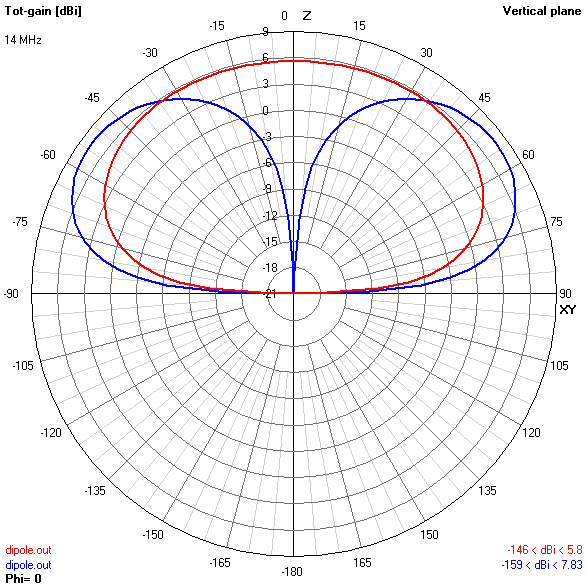 An antenna can have quite different azimuthal directional properties at different elevation angles. We will see further that a very low dipole radiates most of its energy directly overhead at 90° (zenith angle), and shows no directivity at high wave angles (60° to 90°). The same antenna, at the same height, shows a pronounced directivity (hardly any signal off the ends of the dipole) at very low wave angles, but hardly radiates at all at very low elevation angles. These issues must be very clear in our minds if we want to understand radiation patterns of antennas. Though he states I want to emphasize that the term horizontal directivity is really meaningless without further definition , he doesn’t really give a clear definition. ON4UN (Devoldere 2005) introduces the term Vertical Directivity in his chapter Antennas: General, Terms, Definitions . There is a lot of discussion about typical path elevation angles ( wave angles ), but there is no discussion about antenna Directivity in the section headed Vertical Directivity. It seems to be another ham invention without clear meaning. ON4UN (Devoldere 2005) explains his own term Directivity Merit Figure (DMF) We can now define a figure of merit for the directivity (front response to back half-hemisphere) as being the difference between the forward gain at an optimum wave angle (for example, 20°) and the average rearward gain . (Rauch nd) describes a term Receiving Directivity Factor (RDF) as the ratio of response in the desired direction (from a two dimensional plot) to the overall gain of the antenna . His worked example uses the Gain as the response and AverageGain (Gain averaged over three dimensional space) as the overall gain , so he calculates Gain/AverageGain (or the equivalent in dB) as the RDF. AverageGain is numerically the same as Efficiency, so Rauch’s RDF is Gain/Efficiency which is the well known term Directivity (apparent by rearranging the equation Gain=Directivity*Efficiency). It is unclear why the need for a new term with the apparently the same meaning as the well known term Directivity. Nevertheless, the author of 4NEC2 incorporates calculation of RDF in the software, ARRL publications give it mention. (Devoldever 2005) cites Rauch, and discusses the relative merits of RDF and his own invention, Directivity Merit Figure. As noted in the quotations at the start of this article, there is a wide following for unconventional meanings for the well known term Gain, especially the use of a variable reference for Gain. (Silver 2011) gives the following explanation of Gain: The more an antenna’s directivity is enhanced in a particular direction, the greater the gain of the antenna , and although there is some discussion about isotropic and dipole references, there is not a simple quantitative definition of gain. (Straw 2007 Ch2) gives a quantitative definition of Gain, and although it gives a brief introduction to deciBels, it does not mention Gain referenced to a dipole in free space. Chapter 11 introduces dBd as Gain relative to a half wave dipole in free space, though it does not concede that in the ham world, there are other meanings commonly used. Antenna efficiency is such a simple concept, but apparently quite a challenge for hams. There are no shortage of propositions like the following examples from the thread (QRZ 2007). No textbook definition here, but if efficiency is applied in an engineering sense, I would think efficiency is the percentage of radiated power vs. the percentage of power that is lost as heat. I’m no engineer, but I have read enough engineering texts in my professional studies to draw these comparisons. Antenna efficiency can be measured in seveal ways. b) More useful – percentage of power radiated by the antenna in the desired direction – it does no good to radiate 100% of your power straight up when you wish to talk to DX at an angle of 5% above the horizon. So any evaluation of antenna “efficiency” must be taken with the phrase – “in the desired direction or pattern” . Other postings define it in terms of QSO’s and time. Although the first response provided a correct definition of Efficiency, the thread went to almost 40 posts where many hams offered their own alternative meaning. (Silver 2011) gives a quantitative definition of efficiency: [t]he efficiency of the antenna, η, equals the radiation resistance, Rr, divided by the resistive component of the feed point impedance, Rfp, which for actual antennas includes ground losses and losses in the antenna… . The calculated quantity is equivalent to the total power radiated divided by the power accepted by the antenna. There are industry standard meanings for the terms Directivity and Gain in relation to antennas. Some people prefer to refer gain to a lossless half wave dipole in free space, and would usually denote that as dBd units. Some hams prefer to invent their own variable meaning to otherwise well defined terms, and they do it with dBd units. There is not need to use gain reference to a lossless half wave dipole in free space, isotropic gain is quite sufficient and unambiguous. People who seek clarity in communication avoid terms used ambiguously, such as dBd. Characterising antenna behaviour over real ground is a complex task, and does not lend itself to a single headline figure of merit. Devoldere, John. 2005. ON4UN’s low-band DXing. 4th ed. Newington: ARRL. Duffy, Owen. 2012. Effective Radiated Power (ERP). https://owenduffy.net/antenna/concepts/erp.htm (accessed 14/04/12). FCC OET. 2010. Guidelines for Determining the Effective Radiated Power (ERP) and Equivalent Isotropically Radiated Power (EIRP) of a RF Transmitting System. ITU. 1990. Radio Regulations. ITU: Geneva 1990. QRZ discussion. Dec 2011. dB, dBi and dBd. http://forums.qrz.com/showthread.php?325930-dB-dBi-and-dBd (accessed 19/03/12). QRZ discussion. June 2007. Define “Antenna efficiency” http://forums.qrz.com/showthread.php?136588-Define-quot-Antenna-Efficiency-quot(accessed 22/03/12). Rauch, T. nd. Receiving basics. http://www.w8ji.com/receiving_basics.htm (accessed 22/03/12). Straw, D. 2007. The ARRL Antenna Book. 21st ed. Newington: ARRL. 1.02 04/02/2017 Copied from VK1OD.net (offline).